Dec. 14, 2018: Today the Blue Ridge Environmental Defense League announced a statewide radio ad campaign targeting Governor Ralph Northam’s interference in the air permitting decision on the proposed natural gas compressor station slated for Buckingham County. The 30-second spot is being aired on WRVA-AM News Radio, Virginia’s most powerful AM radio station. The ad asks the Governor to explain his sudden dismissal of two members of the State Air Pollution Control Board who questioned the site suitability of the proposed Atlantic Coast Pipeline compressor station in Buckingham’s Union Hill community. The roots of this site date back to the 1860’s when freedmen established this largely African-American farming community after the Civil War. View Press Release | Listen to the ad. Nov. 30, 2018: Lovingston, VA—Today, on behalf of its members and chapters in Virginia, the Blue Ridge Environmental Defense League (BREDL) called upon Virginia Inspector General Michael Westfall to investigate the firing of two State Air Pollution Control Board members by Governor Ralph Northam. The request also cites threats by the state attorney general to disband the Governor’s Advisory Council on Environmental Justice. The request centers on a proposed natural gas pipeline compressor station air permit. "The Governor's packing the air board is an obstruction of environmental justice for the people of Union Hill and, indeed, for the Commonwealth. His removal of members who question the placement of a polluting facility serves the power companies instead of those in harm's way. This cannot stand." Aug. 29, 2018: The Blue Ridge Environmental Defense League (BREDL) and its five co-plaintiffs, including the Tribal Historic Preservation Officers (THPOs) of the Rosebud Sioux and Cheyenne River Sioux Tribes of South Dakota, filed a reply on Monday, August 27 to the opposition of Federal Energy Regulatory Commission (FERC) and Mountain Valley Pipeline (MVP) to our emergency motion for stay submitted to the D.C. Circuit Court earlier in August. The emergency stay would halt construction on the MVP until the requirements of Section 106 of the National Historic Preservation Act (Section 106) have been met with regard to consultation with Indian tribes. Aug. 9, 2018: The Blue Ridge Environmental Defense League and its chapter Concerned Citizens of Shell Bluff have filed detailed comments opposing the state’s air pollution permit for Plant Vogtle. In the comments, the groups oppose the excessive levels of hazardous air pollution emitted from the cooling towers and other sources in a community already stressed by power plant impacts. They called upon the Georgia Environmental Protection Division to reject the permit. July 19, 2018: This week the Blue Ridge Environmental Defense League and its chapter, Concern for the New Generation, and its members filed an appeal with the Supreme Court of Virginia regarding Buckingham County’s approval of a special use permit for a compressor station for the proposed Atlantic Coast Pipeline. The suit was originally filed February 6, 2017 pro se. Circuit Court Judge William Alexander dismissed the case in January, 2018 on technicalities regarding the form used in the pro se filing. May 29, 2018: ROCKY MOUNT, VA—A team consisting of seven Sioux tribal historic preservationists surveyed the Mountain Valley Pipeline project area in Franklin and Roanoke Counties, VA last week, and the data generated by their survey may be used in a legal challenge to Federal Energy Regulatory Commission’s process of working with Native American tribes as required under Section 106 of the National Historic Preservation Act. The seven team members drove from their homes in the Rosebud Sioux, Cheyenne River Sioux, and Pine Ridge Sioux reservations in South Dakota to Wirtz, Virginia, where they were hosted by members of Preserve Franklin, a chapter of Blue Ridge Environmental Defense League. The team walked the Mountain Valley Pipeline (MVP) corridor on properties in Rocky Mount, Boones Mill, Callaway, and Bent Mountain where landowners had given permission for the survey. Oct. 16, 2017: The Blue Ridge Environmental Defense League (BREDL) strongly condemns the Federal Energy Regulatory Commission’s (FERC) October 13, 2017 decision to grant conditional approval for the Atlantic Coast and Mountain Valley pipelines. The agency granted the certification even though important environmental permits are still in question in three states. Aug. 17, 2017: Boones Mill, VA – On Thursday evening, members of Preserve Franklin, Preserve Floyd and Preserve Roanoke, grassroots chapters of the Blue Ridge Environmental Defense League, held a People’s Hearing on the Mountain Valley Pipeline. Having been denied a hearing by the Department of Environmental Quality (DEQ), Franklin County residents and their neighbors in Bent Mountain, Floyd and Roanoke organized their own hearing in which to comment on the 401 Water Certification currently being reviewed by the State Water Control Board. Aug. 15, 2017: On Wednesday and Thursday, the Blue Ridge Environmental Defense League will hold a series of public forums in Atlanta and Augusta detailing the unsafe conditions at the nuclear power plants now under construction at Plant Vogtle. The meetings will feature Arnold Gundersen, a certified nuclear power plant engineer and a long-time critic of the Westinghouse AP1000 reactors. Aug. 15, 2017: BREDL calls upon Virginia DEQ to require individual permits for each stream and water body crossed by a pipeline. Our review indicates that the site-specific permitting process is lawful, necessary and prudent. Failure to comply would result in degradation of the environment and adverse impacts on public health. May 25, 2017: Today the Blue Ridge Environmental Defense League and chapter Protect Our Fresh Air appealed to the state to reopen the asphalt plant air pollution permit issued last year to Appalachian Materials. A six-page letter pointed to the state’s failure to account for the permit’s impact on Camp New Hope, a refuge for children with life-threatening medical conditions just a few hundred yards from the site of the proposed asphalt plant. Blue Ridge Environmental Defense League and chapters will take to the highways and byways of North Carolina and Virginia for eight days in April on a barnstorming tour of communities threatened by natural gas pipelines. The Stop The Pipeline—Roll Back Pollution campaign will feature Lois Marie Gibbs, the national leader of the grassroots environmental movement since 1981. The roadshow will track the routes of the proposed Atlantic Coast Pipeline and the Mountain Valley Pipeline. On Monday, January 23, 2017 Blue Ridge Environmental Defense League (BREDL), BREDL chapters and other environmental groups filed a motion with the Federal Energy Regulatory Commission (FERC) to rescind and/or supplement the Draft Environmental Impact Statement (DEIS) the agency released on December 30, 2016. The need for this action became clear after Dominion and its partners (including Duke Energy) in the Atlantic Coast Pipeline added thousands of pages of additional information obviously prepared before the DEIS was issued, on January 10, 2017. The motion also requests that the FERC “hold the public comment period in abeyance” until the supplemental DEIS is issued. Jan. 11, 2017: Buckingham County, VA—Members of Concern for the New Generation (CNG), a grassroots group from the Union Hill and Union Grove communities, will take a 6-hour drive to Philadelphia Thursday, Jan 12, 2017 to meet with representatives of the Environmental Protection Agency’s Region III . The group will request that the EPA step in to protect the people who live close to the proposed plant site. Dec. 22, 2016: Today, the Blue Ridge Environmental Defense League (BREDL), in comments to the Federal Energy Regulatory Commission, called upon the agency to select the no-build option for the Mountain Valley Pipeline. In its analysis of the Draft Environmental Impact Study (DEIS) for the proposed Mountain Valley Pipeline, BREDL found many flaws and a lack of thorough study and documentation, from erosion and sedimentation to electromagnetic effects when pipelines are near high voltage electric lines. Dec. 14, 2016: The report, subtitled “Unfair, Illegal and Unjust,” concludes that the Buckingham County Planning Commission failed with respect to its legal obligation to ensure that the facility does not have a disproportionate impact on Buckingham’s African American community. Oct. 27, 2016: Franklin County, Virginia— Today, artists, landowners, and eco-activists celebrated the launch of Woven Gaze: Eyes of the Earth. Conceived by the Blue Ridge Environmental Defense League (BREDL), the unveiling of the project involved many coordinated efforts of people throughout the region; leadership for this launch included Steve and Anne Bernard, Kelly Love and Carolyn Reilly. Oct. 18, 2016: Franklin County, VA – Today at a public hearing, opponents of the proposed Mountain Valley Pipeline presented their arguments against an easement agreement to the Franklin County Board of Supervisors. Many landowners expressed outrage at the deception by the Board about its position on the agreement. Sept. 22, 2016: Roanoke, Virginia—Residents from across the region joined forces this morning to shine a light on Governor McAuliffe's ill-conceived support of two proposed 42-inch fracked gas transmission pipelines—the Atlantic Coast and Mountain Valley Pipelines. The protest, dubbed "Pipelines are DIRTY Business" was held outside the Roanoke Regional Chamber of Commerce where Governor McAuliffe attended the Roanoke Clean Energy Business Roundtable. Updated Aug. 2016: Dominion Transmission, Inc. wants to build a series of compressor stations to move gas through the Atlantic Coast Pipeline. If constructed, the Buckingham Compressor Station would have four natural gas-powered turbines with a total of 40,715 horsepower operating 24 hours a day and 365 days a year. June 29, 2016: In a report released today, “Wasted: A Call for Person County to End its Relationship with Republic Services,” Person County PRIDE launched a new campaign calling for an end to decades of solid waste imports into Person County. June 24, 2016: Raleigh-Today, the Blue Ridge Environmental Defense League (BREDL) announced the filing of an ethics violation against Governor McCrory. Filed with the North Carolina Ethics Commission, the complaint details actions taken by the Governor and his appointees which appear to violate the law prohibiting acts exerting undue influence and improper use of state agency time and resources. June 21, 2016: Franklin County, VA— Today the Franklin County Board of Supervisors heard from concerned citizens regarding the proposed Mountain Valley Pipeline (MVP). During the citizen comment period, two presenters detailed major financial and historical factors against the pipeline. May 17, 2016: Frankin County, VA – Today, Blue Ridge Environmental Defense League (BREDL) Community Organizer Carolyn Reilly presented to the Franklin County Board of Supervisors (BOS) the long-awaited findings from their FOIA request. In documents obtained by Preserve Franklin, a BREDL chapter, Reilly found clear evidence that the BOS is not taking a neutral stand on the proposed Mountain Valley Pipeline (MVP). May 12, 2016: Today BREDL and the Concerned Citizens of Shell Bluff announced a challenge to a license amendment at Plant Vogtle which would increase the potential risk of hydrogen fire and explosion, causing damage to the containment structures of two nuclear power plants now being constructed in Burke County, Georgia. Unaccountably, four years elapsed before the company informed NRC of this risk. April 20, 2016: Community groups across Virginia who are fighting the Mountain Valley and Atlantic Coast pipelines have invited Jane Kleeb to Virginia to share her experience of bringing together an unlikely alliance of landowners, farmers, ranchers and Tribal Nations to fight the Keystone XL pipeline. Kleeb is president of Bold Nebraska and the Bold Alliance. She earned the nickname "Keystone Killer" in Rolling Stone Magazine for her role in successfully stopping the Keystone XL pipeline in Nebraska. Mar. 10, 2016: Today anti-pipeline groups announced a new legal challenge to the proposed Sabal Trail pipeline. The Blue Ridge Environmental Defense League and its chapter Wiregrass Activists for Clean Energy have filed a request for rehearing with the Federal Energy Regulatory Commission, challenging the recent Order of Approval issued by the federal agency. The challenge centers on three issues: economics, environmental justice and eminent domain. On February 24, 2016, the Blue Ridge Environmental Defense League and three other environmental organizations filed a lawsuit in US District Court to compel the US Environmental Protection Agency to update long-overdue standards for thirteen types of industries which emit hazardous air pollution. The goal of the lawsuit is to force EPA to fulfill its mandate to review and determine the risk to public health and set more stringent standards. Blue Ridge Environmental Defense League’s legal representative in this case is Nicholas Morales, Associate Attorney for Earthjustice in Washington, DC. The other plaintiffs bringing the lawsuit are Clean Wisconsin, Midwest Environmental Defense Center and the Sierra Club. Jan. 21, 2016: Today the Blue Ridge Environmental Defense League released a report on sound pollution and called on the Town of Boone to protect residents from excessive levels of noise from stock car races at the newly opened auto speedway on Roby Green Road. The report, "Noisy Neighbors–Sound Pollution in the High Country", reveals the hazards to mental and physical well-being of residents in neighborhoods near the track. Dec. 7: Southern Nuclear Operating Company is seeking to amend its license to relax the construction standards for the Vogtle Electric Generating Plant Units 3 and 4. If permitted by the US Nuclear Regulatory Commission, the changes would alter the reactors’ critical radiation shielding walls. BREDL and Concerned Citizens of Shell Bluff oppose the license amendment because it would endanger plant safety, plant personnel and the surrounding community. Nov. 24, 2015: Today Blue Ridge Environmental Defense League (BREDL) took legal action to challenge the proposed Mountain Valley Pipeline (MVP) by filing a motion to intervene and protest the process. After a careful review of MVPs resource reports regarding the proposed project, the League cited crucial information that challenges the MVP’s request for a Certificate of Convenience and Necessity on three grounds. On October 8, 2015 Blue Ridge Environmental Defense League and Concerned Citizens of Richmond County stood in front of the HQ of NCDENR in Raleigh, NC to announce that they have renewed their citizen's lawsuit against EPA and the state's permit for failure to properly regulate Duke Energy's Turbines in Hamlet, NC. The citizens of Richmond county are already being harmed with excessive amounts of air pollution from Duke's power plant. Oct. 1, 2015: The report concludes that the North Carolina Division of Air Quality's draft permit would not meet state standards for toxic air pollution and recommends that Ashe County take steps to ensure that its Polluting Industries Ordinance be strengthened in order to protect the health and safety of its people. View Press Releases, Videos and Photos from the "Hands Across Our Land" August 18, 2015 events. July 6, 2015: Charging that the Department of Environment and Natural Resources (DENR) acted arbitrarily and capriciously by issuing permits for two proposed coal ash dumps in Lee and Chatham Counties, the Blue Ridge Environmental Defense League (BREDL), Chatham Citizens Against Coal Ash Dump (CCACAD), and EnvironmentaLEE (ELEE) filed a petition for a contested case hearing with the Office of Administrative Hearings (OAH) today. June 18, 2015: The Blue Ridge Environmental Defense League (BREDL) made a specific demand to the Federal Energy Regulatory Commission (FERC) in its comments on Wednesday, June 16, the stated deadline for the FERC public comment period. The organization made it clear in their comments that the FERC needs to offer additional public hearings and a 90-day extension of the scoping comment deadline regarding the Mountain Valley Pipeline (MVP). May 19, 2015: Raleigh- Citing incomplete information, flouting of state law, ignoring public health and environmental justice concerns, and lack of compliance reviews mandated by state law, four environmental groups urged the North Carolina Department of Environment and Natural Resources (DENR) to deny Duke Energy’s plan to dump up to 20 million tons of dangerous coal ash in Lee and Chatham Counties. Blue Ridge Environmental Defense League (BREDL), NC WARN, Chatham Citizens Against Coal Ash Dump and EnvironmentaLEE filed the comments with DENR as the comment period closed. 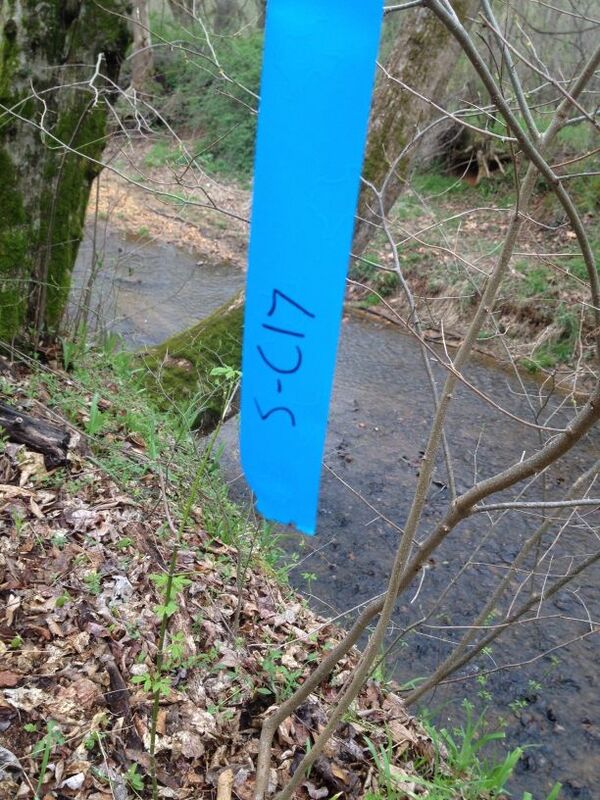 April 9, 2015: Recently, survey crews have been seen in Franklin County on property they did not have permission to enter. Carolyn Reilly, whose land was wrongly surveyed, said, "This is a violation. We mailed a certified letter to the Mountain Valley Pipeline Project Manager denying permission to survey our family’s land." 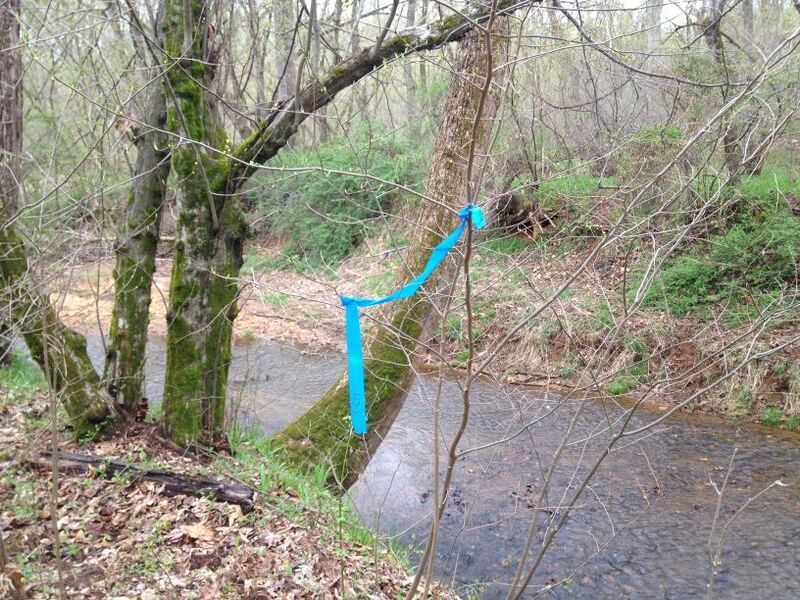 Reilly said there were strips of blue survey tape tied to trees and shrubs near Teels Creek, which runs through her property. Mar. 10, 2015: Raleigh- Joined by Lee and Chatham County residents, Blue Ridge Environmental Defense League (BREDL) announced an ad campaign calling on the Governor to stop Duke Energy’s plan to dump millions of tons of dangerous coal ash into clay mines located in Lee and Chatham counties. The ads, featuring children singing "Ashes, ashes, we all fall down" will run over the next two weeks on News Radio WPTF, 680 AM. Feb. 12, 2015: Today community groups in Virginia, North Carolina and Georgia called for the establishment of local veto power over natural gas extraction, transport and use. At rallies, marches and other public events extending from Floyd, Virginia, across North Carolina to Valdosta, Georgia, people joined in a chorus of protests against pipelines, compressor stations, power plants, hydrofracking wells and waste dumps and for the restoration of property rights and local control over energy policy in the Southeast. On Thursday, February 12, 2015, community groups in Virginia, North Carolina and Georgia will hold a day of press conferences, marches and rallies to call for a halt to natural gas facilities in all three states. This day of action will focus public pressure on local government officials. February 12 will provide a patriotic backdrop to the unified call to defend communities from pipelines, compressor stations, power plants, hydrofracking wells and waste dumps and the pollution they bring. Jan. 14, 2015: Today the Blue Ridge Environmental Defense League released new information pointing to a commercial landfill in Anson County for coal ash disposal. The information, obtained from Duke Energy's Riverbend and Sutton power plant coal ash excavation plans, states that "In the event the structural fill options are not available in Lee or Chatham County, the Anson County Landfill, a permitted solid waste landfill, has been identified as the alternate location." The plan indicates that coal ash would be transported from the power plants to the landfill by rail. Should Clay Mines become Dumpsites? Jan. 9, 2015: Raleigh- Today the Blue Ridge Environmental Defense League revealed the locations of clay mines across North Carolina which could be targeted for coal ash disposal if abandoned clay mine dumping is approved by the state. The League generated a map showing nearly a hundred active and inactive clay mines located in over twenty counties, extending from Henderson County in the west to Dare County in the east with many in the piedmont. Jan. 6, 2015: Today at a press conference in Augusta, a group launched a new program to protect residents from nuclear power plant accidents. The group, Concerned Citizens of Shell Bluff, will be meeting with residents of Augusta, Waynesboro and nearby communities within the emergency zone around the Plant Vogtle nuclear power station. The project centers on one of the most dangerous pollutants, radioactive iodine, which can affect the thyroid gland. Jan. 5, 2015: Today in a letter to the United States Forests Service, The Blue Ridge Environmental Defense League (BREDL) released a statement calling for a ban on all hydraulic fracturing and oil and gas development activities in national forests, as well as restricted use of timber harvest and production, chemical treatment, and prescribed burning, with special protections for designated Wilderness Areas. The statement by BREDL’s Executive Director, Lou Zeller, was submitted to the Forest Supervisor for the National Forests of North Carolina, Kristin Bail, in response to the public comment period for the Nantahala and Pisgah National Forests 15 Year Plan Draft Revision. The final plan will determine the standards, outcomes and desired conditions for Nantahala and Pisgah Forests, which together span over one million acres in western NC along the Appalachian Mountains in eighteen counties. Dec. 1, 2014: The EPA Clean Power Plan's reliance on nuclear power, biomass and natural gas to reduce greenhouse gas emissions is misplaced. Therefore, we recommend that the EPA abandon its assumptions regarding these three methods of generating electricity. Without this baggage, the Clean Power Plan's carbon reduction goals are still achievable, at less cost and without damage to the environment and public health. Nov. 13, 2014: Today the Watauga Citizens for Local Control requested that the Watauga County Board of Commissioners adopt a buffer zone of 1,500 feet between polluting industries and residential dwellings, commercial buildings and churches. The group said that augmented buffer zones, or setbacks, would better protect people from smoke, noise and health risks caused by asphalt plants, electric power facilities, fuel storage tanks and other industrial facilities. The county already requires such setbacks from daycare centers, schools and nursing homes. Oct. 2014: The Piedmont Natural Gas—Wadesboro Compressor Station is one of many similar units strung like beads on natural gas pipelines. They emit huge amounts of toxic air pollution, and this one is no exception. The permit recently issued by the North Carolina Division of Air Quality suffers from fatal flaws which result in excessive amounts of air pollution and place a disproportionate burden on low income and minority populations in Wadesboro, North Carolina. Sept. 29, 2014: Today a coalition of 17 public interest groups filed legal actions to halt the Nuclear Regulatory Commission’s licensing of two dozen power plants. The actions were taken in response to the NRC’s failure comply with the US Court of Appeals DC Circuit order which held that the Commission must assess the long-term impacts of radioactive waste storage before issuing any new power plant licenses. Sept. 17, 2014: Cary Rodgers, the League's NC Environmental Justice Organizer, said, "Long-time residents tell they are awakened at three o'clock in the morning by loud noises from Duke Energy's combustion turbine power plant. And the air around their homes is filled with bitter tasting smoke." He added, "We are demanding that the EPA offset the disproportionate impact of pollution on this community with a corresponding level of resources and technology to correct the ongoing environmental injustice." Reflecting on the company's shift to natural gas, Lou Zeller, Executive Director of the League, said, "The shift to natural gas is not helping at all. In fact, during the last four years the overall level of pollution at this plant has nearly tripled." GROUP RELEASES "WAITING IN A CESSPOOL"
In 1969 the Richmond County Health Department advised residents of Hyde Park their well water was unsafe because of industrial pollution. Four decades later, relocation of the community was finally approved. However, only half of the 130 families have been moved to safety. The video essay, “Waiting in a Cesspool” tells the story of those who have been left behind. Hyde Park residents seek only justice and fulfillment of promises made. Aug. 28, 2014: Raleigh-The proposed Randolph County regional landfill could now be at risk from recent state legislation on the disposal of thousands of tons of coal ash. Aug. 25, 2014: Reidsville- Today, in a statement to the NC Mining and Energy Commission, the Blue Ridge Environmental Defense League (BREDL) demanded that the state the hold additional hearings on the rules for hydraulic fracturing in North Carolina. BREDL’s objections to the hearing process centered on the lack of public participation. The statement, delivered in testimony before the MEC public hearing in Reidsville, said that the current hearing process does not allow all citizens to publicly address the commission, that each hearing is limited to only four hours and that many attendees who sign up to speak are arbitrarily eliminated. Raleigh, North Carolina-August 8, 2014: Today Blue Ridge Environmental Defense League (BREDL) presented the Mining and Energy Commission (MEC) with a formal petition requesting that the MEC develop rules to control and monitor air emissions from fracking sites. The League's petition points to the need for action, stating: "Air emissions from hydraulic fracturing are affecting public health in other states. The recommendation and adoption of the Rule would protect the residents who may find themselves in proximity to gas fracking operations in North Carolina." Commissioner Magwood failed to recuse himself on key votes. WASHINGTON, D.C. – June 18, 2014 – Today a broad coalition of 34 public interest groups called upon Commissioner William D. Magwood to resign from his position on the United States Nuclear Regulatory Commission. The groups cited his recent taking of a job promoting nuclear power while serving on the U.S. Nuclear Regulatory Commission as the cause. June 2, 2014: Today, with the announcement of the United States Environmental Protection Agency's new plan to limit global warming, the Blue Ridge Environmental Defense League issued a statement praising the move as a giant step forward. May 22, 2014: Raleigh- Yesterday, the North Carolina Senate passed S734, which will seriously diminish the state’s ambient monitoring network. If it becomes law, the bill will require the Division of Air Quality to take any ambient monitor not required by the Environmental Protection Agency offline by September 1, 2014. Additionally, the Lee County monitoring station, set up in 2013 to do baseline monitoring of the air prior to any hydraulic fracturing activities, may be on the list. May 8, 2014: The Georgia Environmental Protection Division is considering a massive surface water withdrawal permit request from Southern Nuclear Operating Company for the two new Vogtle reactors under construction near Waynesboro, Georgia. The reactors, which could operate for 60 or more years, could withdraw up to 74 million gallons of water per day from the river. Nuclear power plants are water hogs! April 9, 2014: Lithonia– Today, Citizens for a Healthy and Safe Environment (CHASE) announced they have joined the Blue Ridge Environmental Defense League (BREDL), a regional environmental justice non-profit organization. The link with the multi-state organization will give CHASE greater capacity to defend the residents of Dekalb County from toxic air pollution. March 24, 2014: Today the Blue Ridge Environmental Defense League released a technical report which details the dangers of landfilling coal ash and recommends the proven saltstone technology for the coal ash at Duke Energy's fourteen power plants. The report entitled "Coal Ash Disposition: The Alternative for North Carolina," describes the saltstone technology which would encase the coal ash waste and isolate the toxins from the soil, air and water. BREDL Demands: "Don't Dump Coal Ash on our Communities"
March 20, 2014: The Blue Ridge Environmental Defense League has announced a new campaign to block the landfilling of coal ash from Duke Energy's plants. Staff and volunteers are working with county commissioners and environmental justice advocates to prevent this hazardous waste from contaminating groundwater and drinking water in the state’s mega-dump communities.The League warns that landfilling would endanger public health and the environment. The League's Executive Committee has determined that the full liability for the coal ash should be borne by Duke Energy. For over twenty years the League has identified the dangers of waste landfilling. Cary Rodgers, BREDL's NC Environmental Justice Organizer who resides in Anson County, said, "The people who live near this mega-dump are primarily African American and many of them are poor. Handing coal ash over to a commercial company which dumps for dollars is a grave danger to our groundwater and nearby residents." Lou Zeller, Executive Director, added, "The League has shared our formal position against coal ash landfilling with other NC organizations and hopes that they will join us in opposing this quick and dirty solution." March 12, 2014: Raleigh- Today, the Blue Ridge Environmental Defense League (BREDL) charged that the NC Division of Air Quality has violated state law in pending changes to the state air toxics standards. BREDL revealed that state employees who were exempted by Governor McCrory from state personnel protections have been improperly utilized as hearing officers by the Division of Air Quality. According to the law, exempt employees cannot serve as hearing officers. Feb. 27, 2014: Today the Blue Ridge Environmental Defense League filed a legal challenge to require a full federal analysis of storage of irradiated fuel at the Sequoyah and Bellefonte nuclear power plants. The petition demands that NRC do a complete environmental impact statement on the effects of accidents and leakage on public health and environment. The League also filed a challenges at a power plant in Virginia. Feb. 27, 2014: Today the Blue Ridge Environmental Defense League filed a legal challenge to require a full federal analysis of storage of irradiated fuel at the North Anna nuclear power plant. The petition demands that NRC do a complete environmental impact statement on the effects of accidents and leakage on public health and environment. The League also filed challenges at two other power plants in Alabama and Tennessee. Feb. 18, 2014: Today the Blue Ridge Environmental Defense League announced that, based on federal law, a public hearing must be held before the Rural Utilities Service moves in support of a proposed biomass power plant in Wadley. In comments submitted to Rural Utilities Service, the League detailed the hearing requirement and other problems presented by the proposed action. Jan. 29, 2014: Today two groups announced the filing of a Clean Air Act lawsuit with the US Environmental Protection Agency against the permit for the Richmond County Combustion Turbine Facility in Hamlet. In a legal petition filed January 17th, the Blue Ridge Environmental Defense League and the Concerned Citizens of Richmond County stated that they oppose the air pollution permit because of North Carolina’s failure to comply with the federal Clean Air Act. The two principal objections were that the NC Division of Air Quality had: 1) Failed to require the best available pollution controls for hazardous air pollutants and 2) Failed to properly address the question of common control of the electric power turbines at the site operated by Duke Energy Progress and Piedmont Natural Gas. Jan. 23, 2014: At the Stokes County Planning Board meeting in Danbury on Thursday night, The Blue Ridge Environmental Defense League (BREDL) submitted testimonies opposing the re-zoning of 77 acres for industrial bioremediation, the depositing of petroleum- contaminated soil onto farm land. No Toxic Trespass—No Fracking Way! Nov. 19, 2013: Today the No Toxic Trespass—No Fracking Way tour rolled into Sanford, North Carolina. At a press conference at the Lee County Courthouse, the Blue Ridge Environmental Defense League called upon Governor Pat McCrory to defend the state's rural and suburban communities from the hydrofracking industry's seizure of landowners' rights. Nov. 18, 2013: Today at a press conference in Winston-Salem, the statewide Blue Ridge Environmental Defense League launched the No Toxic Trespass—No Fracking Way! campaign to prevent hydrofracking in North Carolina. This week the group will take its message directly to many of the communities most at risk from hydrofracking, the invasive process for the extraction of natural gas. Featured at the conference was Lois Marie Gibbs, who organized her community in Love Canal, New York, and triumphed in establishing the Superfund for toxic chemical cleanups. Speaking about the impacts of hydrofracking, Gibbs said, "What we witnessed were wrecked communities which mirrored the broken rock out-of-sight and underground." She blamed the boom-town phenomenon created by natural gas and other fossil fuel industries for the social ills and added, "Rising levels of crime and disease come to town with the drilling rigs." Gibbs cited an independent study of rural communities before and after hydrofracking revealed a 62% rise in gonorrhea and chlamydia, two sexually transmitted diseases. She concluded, "We don’t need it. We don’t want it!" Nov. 13, 2013: Next week the statewide Blue Ridge Environmental Defense League will launch a four-day barnstorming tour of cities and towns across North Carolina’s fracking zone. Spanning the state with a series of events from Stokes County in the north to Anson County in the south, the tour will feature the nationally-recognized mother of the grassroots environmental movement, Lois Gibbs. Sept 12, 2013: At a press conference today, the Blue Ridge Environmental Defense League (BREDL), joined by Alamance, Anson and Lee County residents, called on the North Carolina Environmental Management Commission (EMC) to require regulation of fracking air emissions. Aug. 26, 2013: Raleigh- Blue Ridge Environmental Defense League (BREDL) has launched an ad campaign urging Governor McCrory to say NO to forced pooling. The radio ads will run through Wednesday August 28, 2013 on WPTF am stations 680 and 850. Aug. 20, 2013: The ATSDR’s public health assessment falls short in its analysis of offsite health impacts from the toxic air pollutants emitted from the Savannah River Site in South Carolina. In our report entitled Sow the Wind–Toxic Air Pollution from the Savannah River Site, we investigated the air toxics which are emitted from large and small smokestacks at SRS and how they interact to raise downwind pollution levels in Jackson, New Ellenton, Williston and other communities. June 6, 2013: The results of a detailed investigation released today reveal residents living near or downwind of Browns Ferry are at greater risk for cancer and death than average U.S. communities. The study found potential links between radioactive emissions from Browns Ferry and adverse health effects in seven counties near and downwind of the plant. May 7, 2013: BREDL’s petition points out the dangers in Tennessee Valley Authority’s request to extend the license of its troubled Sequoyah Nuclear Power Plant. The most significant risk is a system which depends on baskets of ice to prevent a Fukushima-style explosion of the reactor building. Our petition uncovers a fatal flaw based on aging and the inability to inspect critical parts of the reactor building. BREDL is calling for the early closure of all seven plants of this manufacture in Tennessee, North Carolina and South Carolina. People For Clean Mountains (PCM) has called on Transylvania County Commissioners to enact a moratorium for 18 months on any further development of the proposed Penrose biomass facility. “There is an emerging body of evidence that a facility like the one proposed can pose significant public health risks while also hurting the county’s economic recovery and development,” says Danna Smith, a PCM volunteer. An application has been submitted to the North Carolina Utilities Commission by RD-Penrose 1, a subsidiary of RENEWable Developers, LLC for a certificate of convenience and public necessity for an electric generating plant near Brevard, NC. If approved, the plant would use up to 100 tons per day of household trash and wood waste to generate up to 4 megawatts of electricity. April 17, 2013: Raleigh- Today, Blue Ridge Environmental Defense League (BREDL) joined over 90 medical professionals and 25 organizations calling on the North Carolina General Assembly and Governor Pat McCrory to require that a health assessment be conducted before any fracking is allowed in North Carolina. A letter requesting the health assessment will be sent to Legislators and the Governor. At the press conference, health care providers spoke of the necessity of the health assessment and others held signs saying, “First Do No Harm,” and “An Ounce of Prevention is Worth a Pound of Cure”. February 28, 2013: Blue Ridge Environmental Defense League chapter leaders Julius Kerr and Laura Sorensen testified at the North Carolina Utilities Commission hearing in Charlotte. They joined the chorus of opposition to wasteful, costly pollution generators and money sinkholes proposed by the electric utility companies. For example, the League revealed that to date Duke Energy has reported over $300 million in spending on its proposed Lee Nuclear Station in South Carolina with no license approved or construction started. SCOTTSBORO, AL - On Monday, February 4, Mr. David Lochbaum, Union of Concerned Scientists (UCS) Director of Nuclear Safety, will bring a Nuclear Safety - Nuclear History presentation to the Jackson County Commission, at 5PM Central Time at the Jackson County Courthouse. His presentation will be repeated at the Scottsboro City Council, Scottsboro City Hall at 6PM Central Time. Lochbaum, a nuclear engineer, is one of the nation’s top independent nuclear power experts. Nov. 19, 2012: Today Georgians concerned about Plant Vogtle met with Obama Administration officials to deliver a letter of grievances against the nuclear power plant in their midst. The meeting at the White House conference center included Jon Carson, Director of the White House Office of Public Engagement, and Paul Seidler, Director of External Affairs for Environmental Management for the US Department of Energy. Among those at the meeting representing the Blue Ridge Environmental Defense League were Rev. Charles Utley, staff Environmental Justice Campaigner, and Board Vice President Rev. Willie Tomlin. Oct. 10, 2012: Today environmental groups in Georgia, Alabama and Tennessee called for a government investigation of the principal federal contractor for the Department of Energy’s plutonium fuel program. In comments sent to the US Department of Energy, the Blue Ridge Environmental Defense League detailed the risks to public health and national security posed by the plutonium fuel program and the actions of Areva, the French government conglomerate which is part of Shaw Areva Mox Services. The group cited a legal dispute between Areva and the Tennessee Valley Authority over a $76 million charge for fuel services. The costs were later reduced to $26 million but without explanation. Aug. 28, 2012: Today residents of communities targeted for waste-burning power plants were denied the right to speak at the North Carolina Utilities Commission hearing in Raleigh. The denial sparked charges of bias and injustice from the silenced groups. The Commission, convened to consider deadlines affecting animal waste power generators, did grant electric utilities and poultry, pork and energy groups the opportunity to testify. WASHINGTON, D.C. – August 7, 2012 – The U.S. Nuclear Regulatory Commission (NRC) acted today to put a hold on at least 19 pending reactor reviews – nine construction & operating licenses, eight license renewal, one operating license, and one early site permit – in response to the landmark Waste Confidence Rule decision of June 8th by the U.S. Court of Appeals for the D.C. Circuit. The NRC action was sought in a June 18, 2012 petition filed by 24 groups urging the NRC to respond to the court ruling by freezing final licensing decisions until it has completed a rulemaking action on the environmental impacts of highly radioactive nuclear waste in the form of irradiated, or ‘used’, reactor fuel storage and disposal. On June 29, 2012, Superior Court Judge Howard E Manning ordered that the North Carolina Division of Air Quality (DAQ) keep documents confidential that were previously ruled to be public by that agency. The judge’s order was contrary to the arguments made by the NC Attorney General’s office and the North Carolina Environmental Management Commission, which supported DAQ. The judge ruled that, although emissions information was public information, it would be unfair to South Atlantic Galvanizing to release the documents, despite State and Federal law. April 16, 2012: An adverse decision by the Nuclear Regulatory Commission (NRC) reached today will force parties concerned about the already troubled Vogtle nuclear reactor project in Georgia to file a motion this week in federal court, according to representatives of nine organizations that are seeking to slow down the Vogtle project so that necessary post-Fukushima safety enhancements can be taken into account on the front end, before billions of ratepayer dollars are spent. A streaming audio replay of a related news event is available here. Feb. 22, 2012: A new report by Joseph J. Mangano, MPH MBA finds that in the past decade levels of most types of radioactivity at the Savannah River Site are rising, as are rates of radiosensitive diseases. A new inquiry is needed to understand why these are occurring as cleanup continues at SRS. Mangano directs the Radiation and Public Health Project research group which has assembled epidemiological evidence of a probable causal link between low-level internal radiation from the ingestion of man-made fission products and world-wide increases in immune deficiency diseases and cancer. Feb. 9, 2012: 9 Groups Contend That NRC Is Failing to Fully Consider Fukushima Lessons Before Issuing a Final License to Construct and Operate Two New Nuclear Reactors With the Nuclear Regulatory Commission (NRC) expected to consider as early as Thursday whether to issue the final license for two new reactors at the site of the currently operating Vogtle nuclear power plant in Georgia, nine national, state and regional groups will ask the NRC to delay its decision until the groups can file a challenge in federal court. Feb. 8, 2012: Today in Atlanta, the Blue Ridge Environmental Defense League revealed that potential safety problems at Plant Vogtle are being withheld from public view. 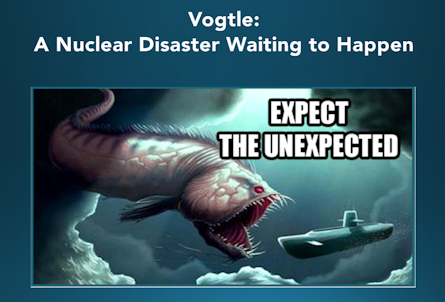 The group said that for over a year it had received no answer to its formal request for disclosure of information about Plant Vogtle’s ability to withstand earthquakes and other threats. In a statement to be delivered today to the Nuclear Regulatory Commission Office of New Reactors’ public meeting on Plant Vogtle construction, BREDL Vice President Rev. Willie Tomlin asks why the agency is keeping the information from public view and reiterates the request for disclosure. Jan. 7, 2012: Today at a church within view of Georgia Power’s Plant Vogtle nuclear power plant, civil rights veteran Rev. Dr. Joseph E. Lowery spoke about the issues currently affecting the people this region. In attendance were many local residents from the rural Shell Bluff community in Burke County and many people from the Atlanta area who arrived in a bus chartered by Georgia Women’s Action for New Directions. Oct. 31, 2011: Today the Virginia Supreme Court will hold oral arguments on Blue Ridge Environmental Defense League’s appeal of an environmental permit for Dominion-Virginia Power’s North Anna nuclear power station. The case centers on a Clean Water Act permit for the North Anna nuclear power station. The Blue Ridge Environmental Defense League first challenged the permit in 2008 and won; the Circuit Court of the City of Richmond concluded that the State Water Control Board’s NPDES wastewater permit for the North Anna electric power plant was “not in accordance with the law.” However, Dominion-Virginia Power and the state Department of Environmental Quality obtained a reversal in the Court of Appeals. Early this year the Blue Ridge Environmental Defense League was granted the right to take its case to the state Supreme Court. Oct. 27, 2011: Today, Blue Ridge Environmental Defense League, Dogwood Alliance, and Heartwood challenged Dominion Virginia Power’s claims that their plan to convert two coal fired plants is “clean” and “renewable.” The groups, with members in Virginia and across the Southeast describe Dominion’s environmental claims made last week in announcing a partnership with wood pellet manufacturer Enviva as misleading. Sept. 28, 2011: Raleigh- At a hearing on North Carolina’s proposed adoption of US EPA’s three-year deferral on controlling greenhouse gases emitted from biomass incinerators, Blue Ridge Environmental called for a full financial accounting of the rule’s impact on health care costs. EPA has not mandated that States adopt the deferral. In addition, BREDL requested a review of the rulemaking process pointing to attempts by the North Carolina Division of Air Quality to fast track the process and circumventing public process. Sept. 26, 2011: This report indicates that any uranium mill tailings storage operation in Coles Hill, Virginia would create high risk of chronic and/or catastrophic release of radioactive contamination into the aquatic environment. Special event celebrates river connections - At this free educational and fun event, visitors will be able to learn about water issues and water recreation, participate in water activities and mini-workshops, hear informative speakers and view a mock life-size radioactive nuclear waste cask. Sept. 6, 2011: Candor NC- Tonight at a meeting organized by Candor citizens concerned about a proposed biomass incinerator to be operated by NC-CHP 1 LLC, Blue Ridge Environmental Defense League released their white paper Second Opinion: The Medical Profession Diagnoses Biomass Incineration. The white paper compiles statements of concern from medical organizations and professionals across the country who oppose biomass incineration. Download - Second Opinion: The Medical Profession Diagnoses Biomass Incineration. May 12, 2011: Today at a press conference in Elon, the Blue Ridge Environmental Defense League released its report The Importance of Sustainable Development in Troubled Economic Times. The new report provides a blueprint for community planning. The League also presented a list of recommendations for economic development which protect the health and quality of life of present and future residents and the natural and cultural resources of Alamance County. May 5, 2011: Today the Blue Ridge Environmental Defense League released its comments on the Environmental Protections Agency’s proposed greenhouse gas emission rules. The League called for a halt in permitting of incinerators using biomass fuel until carbon dioxide reductions are required. Also, the League challenged EPA’s earlier decision that biomass fuel itself constitutes adequate pollution control. The organization challenged the EPA to protect Southern communities by preventing the current onslaught of incinerators burning everything from household garbage to whole trees. April 7, 2011: Today the North Carolina Utilities Commission issued an order granting Blue Ridge Environmental Defense Leagues petition to intervene in ReVenture Park Investments request for a declaratory ruling. The order is in response to the Leagues petition to intervene filed on Monday. March 21, 2011: The Bellefonte Efficiency & Sustainability Team (BEST), Mothers Against Tennessee River Radiation (MATRR), and parent organization Blue Ridge Environmental Defense League (BREDL) issued a statement asking for a review of all nuclear power plants as they are not immune to the kinds of disasters or accidents that lead to catastrophic releases of radiation to air, ground, and water. Jan. 27, 2011: Today at a press conference the Blue Ridge Environmental Defense League launched a campaign to halt biomass energy incinerators in the Southeast. Based on its new report on biomass energy, Smoke and Mirrors, the League will press for local, state and national policy changes to reduce global warming. The message is: Biomass is a False Solution. Read BREDL Press Release | Press Conference Slides | Report: "Smoke and Mirrors"
Jan. 24, 2011: A new report cites broad increases in the amount of medical waste unnecessarily incinerated in North Carolina and argues that much of this waste could be treated safely with less cost using already approved non-burning methods. The report urges state regulators to lead a coordinated effort to reduce unnecessary incineration and involve North Carolina healthcare facilities in solving this problem. Download the report: "Medical Waste in NC: The need to reduce incineration by more effective waste segregation and use of nonincineration technologies"
Jan. 10, 2011: Former nuclear Senior VP points to more cracks found at operating reactors; groups urge advisory panel to force correction of containment design flaws. Dec. 15, 2010: Today the Blue Ridge Environmental Defense League announced that Virginias highest court has agreed to hear their appeal of a Dominion-Virginia Power permit. Nov. 9, 2010: Today at a press conference in Matthews, the Blue Ridge Environmental Defense League and Citizens for a Healthy Environment released an air pollution study which concludes that the BMWNC medical waste incinerator is too dangerous to operate. The groups called for a shut-down of the incinerator. On Tuesday, October 19, 2010 the attorney for the Center for a Sustainable Coast, Georgia Womens Action for New Directions and the Blue Ridge Environmental Defense League will argue the groups case against use of the Westinghouse AP1000 nuclear reactor design at Plant Vogtle before the Atomic Safety and Licensing Board. The AP1000 is slated for use in reactors throughout the Southeast. Sept. 1, 2010: Members of the Blue Ridge Environmental Defense League’s two chapters, Citizens for a Healthy Environment (CHE) and Clean Air Now (CAN), will testify at a public hearing sponsored by the NC Environmental Management Commission (EMC). The hearing will take place on Sept 7th at 7 p.m. at the University of North Carolina Greensboro Campus, Moore Humanities & Research Administration, Spring Garden Street, Bldg. 246, Rm. #1215, Greensboro, NC, 27412. Aug. 17, 2010: League files new contention with nuclear licensing board regarding inadequacy of containment/coating inspection program for Vogtle Units 3 and 4. Louis Zeller, Science Director for the Blue Ridge Environmental Defense League, explained why the groups took this action. "Southern Nuclear Company has overlooked a major problem which we simply cannot allow to go unchallenged. The fundamental requirement of the operator is to protect public health and safety. Southern Nuclear Company is not doing its job. Aug. 12, 2010: This week in a bold move, the Blue Ridge Environmental Defense League filed a legal challenge to the proposed air pollution permit at Plant Vogtle. The August 10th filing was one of the first in the nation under the federal Clean Air Act challenging excessive radionuclide emissions from nuclear power. In a petition to the US Environmental Protection Agency, the League called for rejection of the permit issued by the State of Georgia because it failed to limit radioactive air pollution, failed to protect public health and failed to prevent environmental injustice. June 18: Lou Zeller, representative for the League, said, Dominions switching of reactor technology is like altering the foundation after the walls are up. He said that the switch this late in licensing the plant would make it difficult to regulate. Zeller added, The Commission may lack the regulatory duck tape to piece it together. He drew a comparison of the US Nuclear Regulatory Commission with the Interior Department's Minerals Management Service, the agency which oversees offshore oil drilling and which became too accommodating to its licensees. June 21, 2010: Today at a press conference in Raleigh, the Blue Ridge Environmental Defense League called for a moratorium on the spreading of sewage sludge in critical watersheds. The League released two reports which detail sewage sludge spreading in critical areas that supply drinking water to downstream communities. These sites are located in Orange, Alamance, Gaston, Caldwell, Catawba, and Wake counties. The League maintains that these sludge sites pose an imminent hazard to public health and the environment. Senator Ellie Kinnaird will host a press conference in the press room at the NC General Assembly on Monday, June 21 at 3 p.m. Senator Kinnaird will discuss the findings of a new report to be released by the Blue Ridge Environmental Defense League. The Leagues report, Sludge Spreading in Critical Watersheds of North Carolina, discusses the spreading of sewage sludge on farmlands in these critical watersheds. The report lists the locations of each field and summarizes the risks to public health and the environment. At the press conference, the Leagues Sue Dayton will present a series of maps showing the locations of each of the sludge fields. On Monday at the Pittsboro Board of Commissioners meeting the Blue Ridge Environmental Defense League will release a report on plasma arc incineration. Louis Zeller, the Leagues Science Director, will present the report and recommend a moratorium on waste incineration, including plasma arc. On Tuesday, May 25, the Blue Ridge Environmental Defense League and the Haw River Assembly will hold a press conference to reveal flaws in the proposed permit for the Stericycle medical waste incinerator, located in Haw River, NC. Orange County Resolution adopted on May 17 requiring Stericycle to comply with the new and more protective EPA rules by 2012 instead of 2014.
early implementation of new EPA rules by Oct. 6, 2012. April 22, 2010: The Mecklenburg Board of County Commissioners have given county residents a fitting Earth Day gift. In an effort to help protect Matthews-area residents from exposure to toxic air emissions from the BMWNC medical waste incinerator, located on the border of Matthews and Stallings, commissioners unanimously approved two resolutions at their April 20 meeting, requesting early implementation of the new 2014 EPA guidelines on medical waste incinerator Title V permits in Mecklenburg County. The county wants to shave two years off the four years allowed under the new EPA rules for medical waste incinerators to come into compliance with the new rules. April 21, 2010: Today the League and other environmental groups held a national press teleconference to reveal a fatal flaw in Americas planned expansion of nuclear power. We released a detailed engineering analysis of a problem with the Westinghouse AP1000. This marks the launch of a new national initiative. Jan. 11, 2010: Joint Petitioners file Supplemental Basis for Previously Submitted Contention 6 - TVA has not and cannot meet the NRC's Quality Assurance and Quality Control Requirements. The accident in the nuclear reactor's containment area and the history of prior failures all point to further problems if the Commission were to allow the completion of the virtually moth-eaten 35-year old reactors following years of salvage operations and lack of maintenance and oversight. Dec. 22, 2009: Today in letters mailed to state officials the Blue Ridge Environmental Defense League challenged North Carolinas environmental and utilities regulators to consider major permit violations at a poultry litter incinerator in Minnesota before allowing similar projects to proceed. The plants operator, Fibrowatt LLC, wants to build three more incinerators in North Carolina to burn poultry waste. A settlement agreement between Fibrowatt and the state of Minnesota was released to the League December 17. Oct. 29, 2009: Today organizations concerned with the high costs and environmental risks posed by Southern Company’s plan to build two new nuclear reactors at Plant Vogtle near Augusta, Ga. announced their filing of an appeal in federal court to stop the proposed expansion. Our appeal calls upon the court to review the site permit and the work authorization issued by the Nuclear Regulatory Commission for Vogtle Units 3 and 4. In the petition for review, filed in the US Court of Appeals District of Columbia Circuit, we contend that the NRC violated the Atomic Energy Act, the National Environmental Policy Act, and other relevant laws. The appeal states, "Petitioners seek review and reversal of the issuance of the ESP and the LWA for the Vogtle ESP site." The appeal was filed by attorneys for the Center for a Sustainable Coast, Savannah River Keeper, Southern Alliance for Clean Energy, Georgia Womens Action for New Directions and the Blue Ridge Environmental Defense League. Sept. 3, 2009: In papers filed Wednesday with the North Carolina Utilities Commission, the Blue Ridge Environmental Defense League and three of its community chapters moved to delay and modify a contentious provision of the states renewable energy law. Citizens for a Safe Environment (Duplin County), Citizens Alliance for a Clean Healthy Environment (Surry County), and Sampson County Citizens for a Safe Environment (Sampson County) joined the League in filing the motion. Their motion to intervene asks the Commission to indefinitely delay the use of poultry waste to generate electricity. The poultry waste requirement, or, set-aside, was included in the 2007 legislation adopting renewable energy standards for North Carolina. Aug. 6, 2009: Citizens Groups Claim Victory - Commission Delays Nuclear Plants at Bellefonte: Today citizens’ groups claimed a victory in their fight against Tennessee Valley Authority’s drive to build four nuclear power plants in northeast Alabama. According to the Nuclear Regulatory Commission, further action on TVA’s proposal is halted until at least 2011. Spokespersons for the citizens’ groups see the two-year delay as vindication of their stand against TVA’s plan to complete two nuclear power reactors and to add two more at its Bellefonte site near Scottsboro. New Report Released: An Industry Blowing Smoke - 10 reasons why gasification, Pyrolysis & Plasma Incineration are not "green solutions"
June 15, 2009: BREDL co-releases a new report by Global Alliance for Incinerator Alternatives. The Report - An Industry Blowing Smoke - outlines 10 reasons why gasification, Pyrolysis & Plasma Incineration are not "green solutions". Community forum to look at risks of sewage sludge spreading on farmlands: The Blue Ridge Environmental Defense League (BREDL), and the Center for Health, and Environment and Justice (CHEJ) will host a community forum concerning the risks to public health and the environment from the spreading sewage sludge from wastewater treatment plants on farmlands. The forum will specifically focus on issues related to sewage sludge spreading on farmlands in Orange, Alamance and Chatham Counties, NC. The forum will take place on Thursday, June 4 from 7-9 p.m., at the Cane Creek Baptist Church Activity Center, 6901 Orange Grove Rd, Hillsborough, NC 27278. A press briefing will take place at the Center at 6 p.m. where the speakers will discuss with members of the media the risks associated with land application of sewage sludge on public health and the environment. May 14, 2009: GROUPS TAKE AIM AT BELLEFONTE 1 AND 2 - Today three citizens groups announced a new lawsuit against TVAs Bellefonte nuclear site in Alabama. The groups effort centers on the mothballed nuclear reactor units 1 and 2. They based their opposition on 14 separate flaws in the Nuclear Regulatory Commissions recent approval of a construction permit. The lawsuit was filed by the Blue Ridge Environmental Defense League, the Bellefonte Efficiency and Sustainability Team and the Southern Alliance for Clean Energy. "NRCs got the cart before the horse. Contrary to their own procedural requirements, theyre handing out construction permits for reactors on a 40 year old gutted plant site before new reactor designs have been approved and before environmental impacts have been determined." - Sandra Kurtz, a member of BREDL's Bellefonte Efficiency and Sustainability Team. Feb. 20, 2009: Today a Virginia court in Richmond ruled that state agencies violated federal law and that the water quality permit for Dominion-Virginia Power's North Anna nuclear station is revoked. Oct. 02, 2008: (Clinton, NC) On Tuesday Citizens for a Safe Environment took legal steps in Sampson County to reverse the commissioners decision to re-zone land near Faison. That decision allowed a poultry manure incinerator project to move forward. Fibrowatt proposes to build a plant on the site that would burn poultry manure. The complaint cites negative impacts to the neighboring African-American community, air and water pollution, and detrimental impacts to nearby organic farmers and the areas farm economy. The Superior Court filing charges that the re-zoning is improper and invalid. WASTE IS BIG CLIMATE PROBLEM, NEW REPORT FINDS - A zero waste approach revealed as a top climate protection strategy: Winston-Salem, NC June 5  Today the Blue Ridge Environmental Defense League joined with environmental groups across the United States to release the new report, Stop Trashing the Climate. This timely report, on United Nations World Environment Day and with North Carolina in the midst of a major early June heat wave, points the way for North Carolina to move forward to reduce waste and simultaneously to cut the states greenhouse gas emissions. May 2008: The Blue Ridge Environmental Defense League and its Virginia chapter the Peoples Alliance for Clean Energy have filed to halt construction of a third nuclear reactor at the North Anna nuclear power plant. The petition raises eight major issues: Dominion lacks a realistic radioactive waste plan, Unit 3 would be located on top of a geological fault, the plants cooling system will violate water quality standards, the plant will not adequately limit radioactive emissions to the atmosphere, uranium is an unreliable fuel source, the license would violate the protections of due process and equal protection, irradiated fuel would remain on site, and the plant would be a target for terrorist attacks. The League plans to press the seismic issue and other safety and environmental problems created by the proposed third reactor. The petition to intervene was filed on May 9th with the US Nuclear Regulatory Commission. PC PRIDE Files Legal Challenge to Special Use Permit for Upper Piedmont Environmental Landfill - Jan. 3, 2008: BREDL chapter PC PRIDE (Person County People Rising in Defense of Ecology) has filed a legal challenge in superior court against the December 3rd decision made by the North Carolina Person County Commissioners. The commissioners voted to grant a special use permit to Republic Services of North Carolina LLC for an expansion of the Upper Piedmont Environmental Landfill. - The expansion of the landfill is not in harmony with the existing agricultural and residential uses in the Mount Tirzah area where the landfill is located. - The proposed expansion will constitute a nuisance to the members of PC PRIDE and other members of the public. - The property owners adjacent to and in close proximity to the landfill and proposed expansion have suffered losses of property values and an interference with health, safety and general welfare. - PC PRIDE members were not given a fair and unbiased hearing. Jan. 2, 2008: On Friday, December 28th, the Blue Ridge Environmental Defense League filed a petition against the Virginia's approval of a water permit for the North Anna nuclear power station (NAPS) located near Charlottesville. The League's petition states: The Board's re-issuance of this Permit was in violation of Virginia's State Water Control Law, the federal Clean Water Act, and the Virginia Pollution Discharge Elimination System, as well as other laws and regulations governing water quality. Specifically, state and federal laws and regulations require regulation of and limitations on thermal pollution discharges into Virginia's waters. There was ample evidence presented to the Board and DEQ as contained in the record which demonstrated that thermal pollution discharges from NAPS into Lake Anna are causing and contributing serious harm to the lake and to Virginia citizens' use and enjoyment of that natural resource. Despite the mandate under state and federal law and the record evidence of the thermal pollution problem in Lake Anna from NAPS, this Permit contains virtually no limits at all on thermal pollution. For the reasons stated in this Petition for Appeal, BREDL asks this Court to suspend and set aside the Permit and to remand the Permit to the Board and DEQ for further proceedings consistent and in compliance with federal and state water laws and regulations. On July 31, 2007 the US Department of Homeland Security issued a Notice of Intent to Prepare an Environmental Impact Statement for a National Bio and Agro-Defense Facility. The NBAF would be a new defense research laboratory for biological warfare agents. Five sites are being considered: 1) Manhattan, Kansas, 2) Athens, Georgia, 3) San Antonio, Texas, 4) Butner, North Carolina and 5) Flora, Mississippi. A possible sixth site is also being considered on Plum Island, New York where a federal facility has operated for decades. First, attend the Public Meeting on Sept. 18, 2007. The Dept. of Homeland Security will invite the public to make oral comments. The meeting will begin at 7:00 PM at the South Granville High School on 701 North Crescent Drive in Creedmore, NC 27522. May 22, 2007 At a press conference on the North Carolina-South Carolina line, citizens groups from two states released a new report which details the dangers of high-level nuclear waste shipments under the Global Nuclear Energy Partnership program. Author John Sticpewich of Commonsense at the Nuclear crossroads used the Department of Energys routing criteria to produce the maps and tables in More Than A TAD: A Study of the Problems With the Transport and Reprocessing of Nuclear Waste in the Carolinas. The report lists nuclear power plants in 17 states from which nuclear waste shipments would pass en route to Savannah River, a potential GNEP site. For example, from 2,146 to 4,498 shipments would likely pass through the Charlotte-Rock Hill area on Interstate 77. DOE has already held public hearings on their plans for centralized storage and reprocessing. The Blue Ridge Environmental Defense League opposes DOEs plan, called Complex 2030, which calls for a new generation of nuclear weapons production, for which we believe the Savannah River Site is at great risk. Complex 2030, developed by the National Nuclear Security Administration, is a proposal to construct new facilities to manufacture plutonium warheads, to conduct nuclear weapons research and development, and to store nuclear materials. On October 19, 2006 the US Department of Energy published the Notice of Intent to Prepare a Supplement to the Stockpile Stewardship Management Programmatic Environmental Impact StatementComplex 2030 (Federal Register vol. 71, no. 202, page 61731). The first public meeting on Complex 2030 was held on November 9th in North Augusta, South Carolina, near the Savannah River Site bomb plant. Further meetings are being held near atomic weapons sites in Tennessee, Texas, Nevada, New Mexico and California with a final hearing in Washington, DC on December 14, 2006. The written public comment period extends through January 17, 2007. Our ultimate goal is to change completely the mission of the United States Department of Energys Savannah River Site from military to peaceful pursuits. We are dedicated to ending the toxic and radioactive pollution of the soil, water and air of SRS by achieving a true cleanup of more than five decades of bomb plant contamination. April 17, 2006: Report Finds Duplin Citizens Are Concerned About Proposed Landfill: A new University of North Carolina School of Public Health study released by a local citizens group found that Duplin County residents remain concerned about the potential for declining air quality, contamination of their wells, and lost opportunities for future parks and outdoor activities. The report, A Community Health and Demographic Survey Near a Proposed Landfill Site in Northwestern Duplin County, NC, found slightly elevated rates for allergies and asthma, as self-reported by residents, already existed in a two mile radius around the proposed site near Faison. "A Community Health and Demographic Survey Near a Proposed Landfill Site in Northwestern Duplin County, NC "
Dec. 12: 2005: SENATOR DOLE HELD ACCOUNTABLE FOR UNETHICAL VOTE - Today members of the Blue Ridge Environmental Defense League hand delivered a letter to Senator Elizabeth Dole's Salisbury office challenging her opposition to a ban on using human subjects in pesticide experiments. This summer, Senator Dole voted against a measure introduced by Senator Boxer to ban testing pesticides on children and pregnant women. April 7, 2005: GROUPS CALL ON GOVERNOR TO DEMAND TERRORISM SAFEGUARDS - Today at a press conference in Columbia, citizens groups called on Governor Mark Sanford to halt the impending plutonium fuel shipments through South Carolina and to demand terrorism safeguards at the Catawba nuclear station. Mar. 28, 2005: Citizens Groups Advise SRS Citizens Advisory Board - Sunshine Campaign Will Allow Public To Have Say - Today at a press conference in North Augusta, grassroots citizens groups announced a Sunshine Campaign to open up the process of communication between the Department of Energy, the SRS Citizens Advisory Board and the general public. BREDL joins Center for Health, Environment & Justice (CHEJ) in national release of PVC Report - PVC, Bad News Comes in Threes: The Poison Plastic, Health Hazards & The Looming Waste Crisis. This national report will be released on Tuesday, December 7, 2004. It provides a comprehensive summary of the hazards of PVC, with new information on the looming PVC waste crisis. News Releases and events in 19 States. For information on the national release contact CHEJ at: 703-237-2249, Cell Phone 703-627-9483. In North Carolina, please contact BREDL Staffer David Mickey at 336-769-0955. October 5, 2004: Table slides (in 2 .pdf files) detailing actual radioactive releases to the air and water from Dominion/Virginia Power's North Anna nuclear station, and the high rates of mortality in the area within 30 miles of the North Anna reactors located near Charlottesville, VA.
June 2, 2004: Read Press Release and link to Report - Interstate 73 is one of the most wasteful highway projects in the nation, according to a new report released today by Virginians for Appropriate Roads (VAR), Citizens Concerned about I-73, Blue Ridge Environmental Defense League (BREDL), Taxpayers for Common Sense (TCS), and Friends of the Earth (FoE). The report, Road to Ruin, identifies the 27 most wasteful highway projects in the country. April 27, 2004: Read Press Release and Lou Zeller Statement - Citizens Charge US With Nuclear Treaty Violation : Today at a press conference at the United Nations, the Blue Ridge Environmental Defense League charged the United States with violation of the Nuclear Non-Proliferation Treaty (NPT) and called for international inspections of weapons facilities in South Carolina. Feb. 12, 2004: BREDL Press Release - GROUPS HOLD PEOPLES HEARING ON INTERNATIONAL PAPER: Today in Lake Waccamaw the BE SAFE North Carolina Campaign hosted a public hearing on the air permits and new proposals for International Paper at Riegelwood. Speakers took aim at the recently issued Clean Air Act permit and IPs proposal to avoid meeting federal maximum achievable control technology standards. IP has proposed to substitute a computer-modeled risk assessment for federally mandated technological improvements. Oct. 20, 2003: Today at press conferences in Asheville, High Point and Durham, statewide and regional organizations launched the BE SAFE North Carolina campaign. Groups from across the state will promote the better-safe-than-sorry approach to protection of public health and the environment. The mission of BE SAFE NC is to protect childrens health and to safeguard our air, water, and workplaces. July 25, 2003: BREDL and WEAG cite numerous flaws with DEQs approval of Wythe County, VA asphalt plant. Groups request DEQ to stop relocation and re-open permitting process. Read Press Release | July 25, 2003: BREDL and WEAG letter to Virginia DEQ Director Robert Burnley requesting determination of permit exemptions. (.pdf) | More information including BREDL/DEQ correspondence, background, pictures. May 30, 2002: On Thursday, May 30th the Blue Ridge Environmental Defense League will launch its regional campaign opposing nuclear waste transports from nuclear power plants in North Carolina and South Carolina to Nevada. See Press Release and Press Advisory for details and locations - updated throughout the Roadshow | Please see the BREDL Southeastern HLNW Roadshow page for pictures, reports, letters, and links. March 28, 2002: Roanoke County, Va tire fire emits huge quantities of toxins. Read BREDL Press Release , Chronology of Roanoke County, Virginia Tire Fire UPDATE: April 16, 2002: EPA announces that the Roanoke County Tire Fire is finally out as of 11 am. The fire burned for 25 days over 139 acres. Only 3,000 - 4,000 tires remain on site. According to media reports, those tires will be hauled to a North Carolina recycler. Oct. 11, 2001 - BREDL releases a national report which presents safe alternatives for solving the problems of hospital and infectious waste, making dangerous medical waste incinerators like Stericycle in Haw River, NC unnecessary. The report Non-incineration Medical Waste Treatment Technologies was produced by the national Health Care Without Harm campaign. BREDL Press Release; Executive Summary; Oct. 9, 2001 BREDL letter to NC DAQ regarding Stericycle; Dioxin Fact Sheet; Background on HCWH's report. May 3, 2001: Press Release with links to report In Charlotte, NC today BREDL releases a new plutonium fuels transportation report outlining past problems with the U.S. Department of Energy's handling of plutonium. 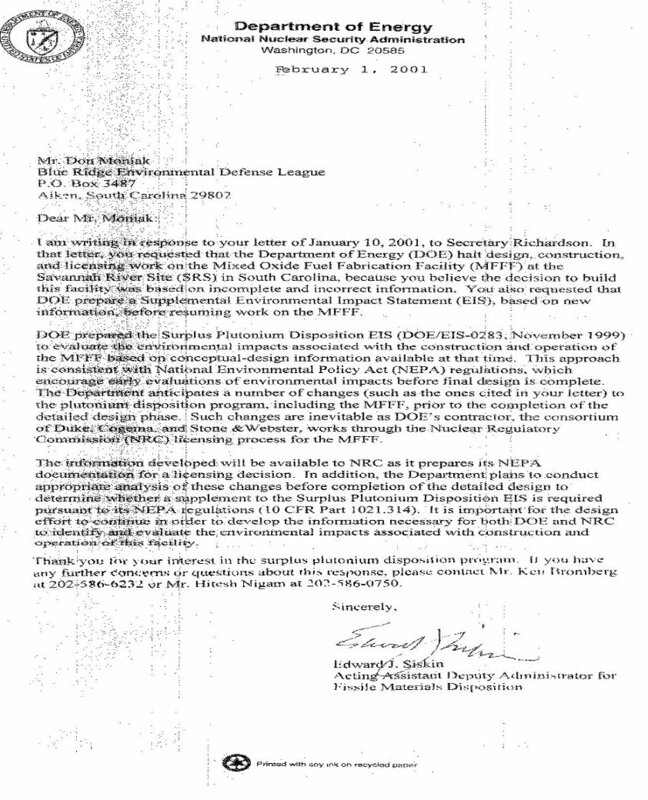 April 25, 2001: Press Release /EPA letter - EPA has environmental objections with I-73 (Roanoke, VA - NC border) project. EPA recommends a supplement be prepared to address significant issues and alternatives. April 10, 2001 - Read GCE/BREDL Press Release - Georgians for Clean Energy and the Blue Ridge Environmental Defense League will sponsor an informational Open House regarding the Department of Energy's ongoing plans to construct and operate a plutonium (MOX) fuel factory at the already heavily polluted Savannah River Site, approximately 90 miles upstream from Savannah. If built, the plutonium factory will generate millions of gallons of liquid radioactive waste and increase the potential of creating more permanent nuclear weapons and power production missions at SRS and the region. 4-8 p.m., April 12, 2001, at 3025 Bull Street, Savannah, GA.
Today at a press conference in Wilmington, the Blue Ridge Environmental Defense League launched a statewide campaign to protect North Carolina school children from toxic chemical exposures. The group plans to work with parents and school officials to determine the level of environmental toxins in the states schools and to implement programs to reduce or eliminate these threats. November 30, 2000 - BREDL letter to NC Division of Waste Management - BREDL Challenges TCLP testing of Special Wastes: The Blue Ridge Environmental Defense League requests that the NC Division of Solid Waste cease the disposal of "Special Wastes" in NC Subtitle D landfills until adequate testing methods are developed and implemented that can adequately determine the hazards of the "Special Waste" streams. November 29, 2000 - PRESS RELEASE: Anson County CACTUS files environmental justice complaint with EPA. Anson County CACTUS is requesting that the United States Environmental Protection Agency (EPA) initiate an investigation into the North Carolina Department of the Environment and Natural Resources' issuance of a June 1, 2000 construction permit allowing Chambers Development of North Carolina, Inc. to construct a Municipal Solid Waste Landfill Facility adjacent to a predominantly African-American community in Polkton, North Carolina. regional, commercial landfill to be operated by WMX in their community. Details about the press conference (including photos and statements) plus a report on the landfill. July 22, 2000 - Russian and American NGOs Blast G-8 Secrecy. Plutonium Plans are a Danger to All Nations. June 9, 2000 - Prisoners Of Our Homes (POOH) holds a press briefing in Charlotte, NC. POOH called for the shut down of the BMWNC medical waste incinerator. Photos from press briefing. June 5, 2000 - Russian and American plutonium agreement draws fire. May 18, 2000 - BREDL/NACAP Press Release regarding air permit At a press conference in Franklin, the Blue Ridge Environmental Defense League and Neighbors Against the Cullasaja Asphalt Plant released a detailed analysis of the pollution which would be allowed if the state approves a permit for the Rhodes Brothers asphalt plant. March 24, 2000 - Press Advisory - Today, representatives of the Blue Ridge Environmental Defense League will travel to Harrisburg to testify in support of Pennsylvania's proposed clean air regulations. The new rule would limit North Carolina's nitrogen oxide emissions to 10,737 tons per year. plutonium as fuel in nuclear power reactors. Nov. 9, 1999 - ANSON COUNTY CACTUS TAKES LEGAL ACTION OPPOSING WATER QUALTIY CERTIFICATION PERMIT - Anson County Citizens Against Chemical Toxins in Underground Storage, filed a petition for a contested case against the North Carolina Department of Environment and Natural Resources, Division of Water Quality, for the issuance of a 401 Water Quality Certification permit to Chambers Development of North Carolina, Inc. The petition was filed with in the office of administrative hearings in Raleigh. Enforcement actions against Solite, Inc. may be forthcoming - The North Carolina Division of Waste management confirmed on Sept 13, 1999 that enforcement actions against Solite, Inc. may be pending. Report released by the Blue Ridge Environmental Defense League (BREDL) and Prisoners Of Our Homes (POOH) shows mercury in tuna threatens developing babies and young children. Citizens ask North Carolina hospitals to reduce threat by eliminating mercury from health care. Virginians For Appropriate Roads, a BREDL chapter, press release regarding I-73 project's mention as one of the 50 most wasteful highway projects in the nation. Anson County Citizens Against Chemical Toxins in Underground Storage (CACTUS) and the Blue Ridge Environmental Defense League (BREDL) join a new national coalition asking Congress to end federal taxpayer subsidies that waste natural resources, damage the environment, hurt local recycling businesses and discourage recycling.